Nokia working on dual-screen 3D Windows device? Nokia may have teams beavering away on its first batch of Windows Phone 7 handsets, but it looks as though it may have a couple of Windows tablet devices in the works as well. 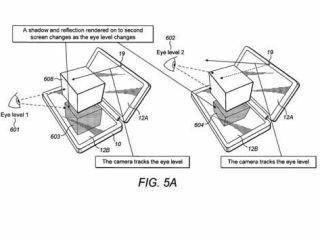 A patent for "autostereoscopic rendering and display apparatus" was published in late April, showing a dual-screen device with 3D imaging complete with an eye-level tracking camera. It should create an experience not a million miles from that of the Nintendo 3DS, given the absence of 3D specs and the dual-screen set up. As far as the Windows 8 tablet rumour goes, it comes from noted mobile phone commentator Eldar Murtazin, who writes on the Mobile Review forum that Nokia will launch one tablet in 2012, possibly pushed back to 2013. Whether these two devices will turn out to be one and the same remains to be seen. Murtazin also says that 'most tablets will go with Win 8 2012', which ties in with Microsoft's apparent plans to launch a tablet-focused Windows 8 OS, but not until next year. Nokia CEO Stephen Elop recently confirmed that the company was "right now assessing what's the right tablet strategy for Nokia." It looks as though those assessments could now be complete.